Many thanks to Elaine Lerner for her recent $14,000 donation to OC Bird of Prey Center! The money donated will greatly help our relocation efforts to our brand new facility and future permanent home. 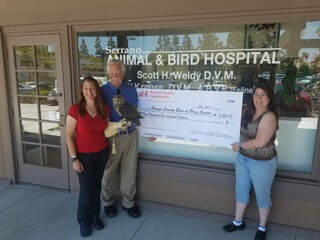 ​Thank you Animal Health Foundation for their recent $2,500 donation to OC Bird of Prey Center! Read more about their donation at http://www.animalhealthfoundation.net/news/item.html/n/20296. The Orange County Bird of Prey Center utilizes cleaning supplies for center maintenance and enrichment tools for the birds. If yo​u would like to donate supplies to the center, please fill out the form below. Thank you for your contribution. We are in the planning process of building our new, public facility. Please help us create this amazing home for the raptors! Please include the supplies you would like to donate to the Orange County Bird of Prey Center. One of our leads will be in touch with you shortly thereafter.